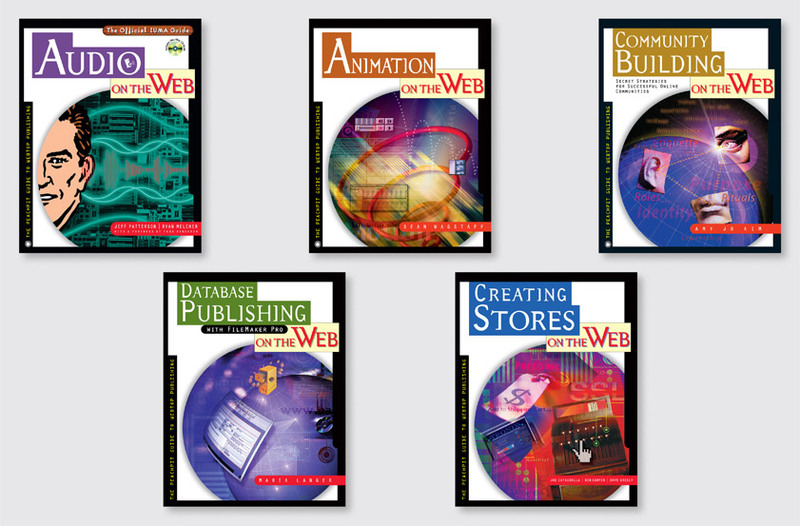 The On the Web Series, published by Peachpit Press, provides expert advice for Webtop publishing, offering practical tips and valuable advice from some of the Web’s leading pioneers. Key online publishing topics are covered, including animation, audio, creating stores, community building, and database publishing. Our solution uses a crisp black border to frame the series tagline and aid legibility when reproduced at small sizes in software catalogs. Each title is distinguished by a distinctive outer shape and identifying color. The circular shape containing the illustration evokes a window into the content of each book while creating a metaphor for a world within the Web.